If an encountered piece of ice is trashed, does Chief Slee gain power counters? Yes. If an encountered piece of ice is uninstalled, then the encounter immediately ends. If the Runner trashes Hive during the encounter while the Corp has 2 agenda points in their score area, how many power counters are placed on Chief Slee? What if the Runner encounters and trashes an ice that gains subroutines, like Komainu? Chief Slee references the number of unbroken subroutines that were on the encountered ice at the time the encounter ended. Thus, if the Runner trashes Hive in this situation, Chief Slee will gain 3 power counters. Likewise, Chief Slee will gain as many power counters as the Komainu had subroutines when it was trashed. Chief Slee's punch hits 25% harder than a bomb in your house, and is around 71.5% as strong as a guided missile. Chief Slee's grin is made up of equal parts delight and disgust at the frailty of the human body. Chief Slee laughs at your 'armour', regarding it as a merely a girdle for your inadequacies. Someone once tried to kill Chief Slee with an unregistered pistol. She would have been insulted, were she not so amused. Chief Slee never saves face, she only wrecks it. Jinteki tried to recruit her once. It is said her laughter still haunts the recruiter to this day. In the language of the ancient English, Slee means 'sly', 'sagacious', and 'cunning'. She enjoys the irony. Chief Slee feeds on your failures, especially the ones you think you got away with. With that in mind, some of Chief Slee's favourite runner sayings include, "I'll just take the tag. ", "But it doesn't end the run, right? ", and "Ha! All that money on a Data Ward and I'm not even tagged!". Speaking of tags, Chief Slee has, to use her words, "no time for that", and works just fine without them. She considers them yellow, in both the literal and Texan colloquial sense. Chief Slee doesn't forget. You can clear all those tags. You can beat all those traces. You can distract her with as many pink kitties as you like. She's not gone until she's gone. Of course, she wouldn't be a Weyland card without being unwieldy. Her damage can be mitigated if you wear enough layers, and her low trash cost requires that you spend more effort than you might like to protect her. However, even if you don't use her for a killshot(punch), her presense will clamp down on a lot of shifty runner bullsh*t, and make them play something closer to the game you're putting in front of them, which in some cases can really slow the runner down. She is cheap to rez. She affects all servers, and she has no additional triggers beyond the runner messing up five times and the Corp having a click to spare. "Oh, you'd better be ready when you run buddy, because if you hit something and don't have the nouse to break it good and proper, you'll remember the words 'Inside Job' not as the time you made a sneaky fast steal, but as the time when my bosses rezzed a Hive and I played Bop-It with your lungs." 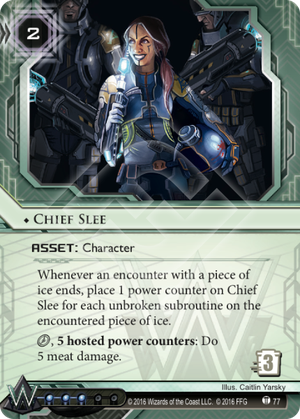 One of my favorite cards to be released in a while, Chief Slee is a high-priority asset, that, while hard to use effectively, can be oppressive and even game winning. Looking at her stats, she has a few notable weaknesses. 2/3 rez-trash is okay, but not great in the asset saturated meta, and 3 influence makes it a tough splash. It's easy to scoff at her requirements and immediately dismiss her as instant binder fodder, but I truly think she has great potential. The key to using her is opportunity. You want her to be one of the first things you put down, so you want to make her easy to find or fetchable. Executive Boot Camp and Tech Startup are pretty good choices. Then, you put her in a remote and leave her with some protection. Prisec is excellent here from both a choice standpoint and a thematic standpoint. Then you wait. They hit something they can't break and you rez her, getting hopefully 2-3 counters. Worst case is they run her, trash her, and have to pay to remove a Prisec tag or get through a piece of ICE. Not too bad. For the cost of 2 and click you've basically added something at the top of the runner-to-do list. She says,"Go ahead and run. I'm cool with that. I'll just be over here cleaning my guns." This puts the runner into one of two trains of thought. "Oh crap Imma die" They don't run for a while. You score a Project Atlas or a Corporate Sales Team. Good. Or "Sorry Slee, you gotta go!" And they aggressively spend precious time and resources to trash her. However there is a third scenario which I think is the best. It most likely won't work, but a surprising amount of games it does. Sometimes runners are so used to not-seeing specific cards that they go, "Huh. That card's pretty neat. Probably won't do anything though. They leave her be, She slowly but surely gets counters. They start to sweat. "I'll just Medium Dig" they reassure themselves. "Account Siphon will work!" They say. Then you rez a Data Ward or a Bulwark in their face. And they are so surprised and bewildered they will just read Chief Sleeover and over again, hoping some technicality will save them. It won't. Well, at least the last thing you saw was a pretty face. tl;dr: Chief Slee is a powerful asset that requires protection to use effectively. When she fires though, thet'll be one of the best games you've ever had. EDIT: With Şifr out now, I also feel this card could see play as a good slap on the wrist against Parasiting big ice in Blue Sun or elsewhere. After playing with this card for a little bit, I can confirm that attempts to make Slee's Pachinko Parlour with cheap ICE that the runner normally doesn't have to break are largely doomed to failure. She just doesn't cost enough to trash to protect herself, and if you try to run her out of faction in CtM or Industrial Genomics to rattlesnake people away from trashing her you'll run right out of influence to do anything else. Yes, you can protect her in what would be your scoring remote. Yes you can make someone pay 5 to get past a free to rez Bandwidth to get to your HQ safely, but that's exactly what they'll do if you turtle behind porous ice without a place to advance agendas, and Slee will stay sad at 1-2 power counters until a Political Operative comes to take her out of her misery. She just isn't quick or dependable enough to build a kill strategy around. If she ever becomes threatening enough, they'll come kill her after they've amassed the credits to do it properly, Prisecs be damned. And you'll be stuck trying to sneak out agendas on a secondary remote while your centrals are spread thin. However, that all being said: I believe she's still marginally useful. More than some give her credit for. The best use of this card to me seems not to build a deck around (though you will be sorely tempted to), but rather as a way to threaten the runner's sense of security in facechecking ice until she is dealt with properly as a way to buy time to set up a proper Glacier. Throw her out in her own remote with a Prisec or a Mumbad Virtual Tour. When the runner feels pressured enough that they no longer feel safe facechecking new ice on your centrals, they'll come to trash her and give you a small scoring window to work with. Sometimes, that's all you need. Aim not to ever kill them with Slee, but instead to put a mandatory break period for the runner somewhere 3-4 turns out. There were a few, brief, shining moments in my head the first time I read Slee where I thought I could Dedication Ceremony a Mumbad Construction Co. straight into Slee. But sadly 'tis not to be. If for some reason there are ever just one or two more cards that are willing to spread a power token or two put this card back on your radar though. As of now she's not good. But at least in concept she's fun. I've tried to make Slee work for a week or so now, and I'm ready to pronounce judgement. I guess the TL:DR is that she is just as cumbersome as she appears to be. Let's look at the base case. You spend a click to install her, and, later, you spend 2 creds to rez her. Once she is loaded you spend clicks to deal 5 meat damage until you win. Sounds great. The unwieldiness comes from how loading her works. So, since she is an asset, she is taking up a whole remote server. She doesn't have a paid ability self trash Jackson Howard or Executive Boot Camp kind of thing, so you are open to Temüjin Contract and Bank Job style shenanigans if you put her in an open server. First off, Slee is in the wrong faction. Weyland doesn't run Pup or Resistor , where the corp gets to fire the events and the runner just mitigates them with their text. Weyland's core is typically a barrier with one "end the run" sub. So if you want Slee to work at all you have to swap out your ice a bit. A reasonable compromise between gimmick ice that exists just to load ( Ireress and its ilk), and the typical weyland walls is our endless supply of multi sub walls. Curtain Wall Spiderweb . Good stuff. If the runner hits one of these without a breaker, you rez the barrier and slee, and you are halfway loaded. And then the runner moneys up, and runs over and trashes Slee. Womp womp. So forget that. Let's load her in 1 encounter. Hive Tour Guide . Loving this. They run into this noise...and blam, bounced. Slee is loaded. And then the runner runs over and trashes Slee! Womp womp. Maybe it was last click? But Snare! is a card. People who end turns tagged vs. Weyland tend to learn better quickly. It is a rare run vs. Weyland that goes off last click. The only way that this really works is if the faceplant was INTO THE SLEE SERVER. She was behind the Tour Guide. The runner ran her, presuming a Project Atlas or other never advance, and you bounced them and loaded her in one click. Good on ya. Just pointing out that we are already a bit in the weeds here. There are 4 other assets to get the Tour Guide up to this level? You haven't scored any points to get your Hive out of range? But anyway. The runner bounces off the Slee server. She rezzes and loads up. Aw yeah, death is coming! And they draw up to 5 cards (or put down a plascrete). Womp womp. That's right. Even if Slee is fully loaded. Even if she doesn't get trashed. They can just survive it. So maybe consider Slee outside of Weyland? There are factions where trashing is harder (IG), there are factions where you let the subs fire more (red, yellow). But she is 3 influence! So she is the whole game plan. And a lot of those decks are horizontal, so the whole "subs going unbroken" concept is kind of iffy. She's just a mess. Like, Slee is fundamentally a member of the species of Weyland Assets that pretend the game lets you have multiple mostly safe remotes. The Root or Mumbad Construction Co. are better versions of the idea of things that you might put into the scoring remote or a peer to it. She's somewhere between those and The Board (which is, admittedly, worse than Slee). She'd be decent, but not great, with a higher trash cost. As it is, Slee is a gimmick card, begging for a deck to be built around her, and delivering to anyone who falls for it a deck that wins less often than the old SEA/Scorch setup. How come the worst people in the whole world always make this face? It's gonna be fun facechecking a Tour Guide. Or even Brainstorm or Komainu, for some additional murder on top of your regular murder. Gagarin horizontal decks might become less scory, more killy. If you feel like BOOM! wasn't enough, this theoretically lets you deal 15 damage in a single turn. Has a janky feel to it, but my gut tells me there is a way to utilize this card in an effective manner that, once found, would make playing Netrunner even more of a bloody chore than it currently is. With Chief Slee you can field the wonderfull Burke's Bug combo A.K.A the combo that's like "oh noes what did I build combo" and then "that exactly what I planned to do : losing, LOL". That's why she's smiling at the corp ID I guess.